Details. It’s all in the details, right? I see this print multiple times every day, and contemplate the little stories in the details of the room. Perhaps the first thing I noticed that jarred my eye (and my thinking) was the row of glass vases for forcing bulbs. They look so modern, don’t they? But the shape is classic– form following function– and findable today. How pleasing that my mother’s winter ritual of filling windowsills and mantles with forcing bulbs can be visually documented to one of my favorite eras–and was, indeed, common in the past. This is one of those “everybody did it” ideas I can endorse. What else is on the mantle? A clock, undoubtedly ormolu– though it could be much worse. 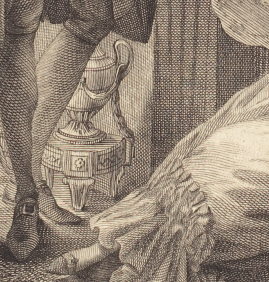 And yes, the cupid on the clock has meaning in this print. And then there’s this: the hot water urn– or is it? Tucked into the fire place, I was initially pretty sure that’s a hot water/tea/coffee urn, meant to go with the tea or coffee cup on the mantle (see above; it’s in front of the bulb vases). Hot tea or coffee would be welcome on a cold winter’s evening, and the water would stay warmer tucked close to the fire. 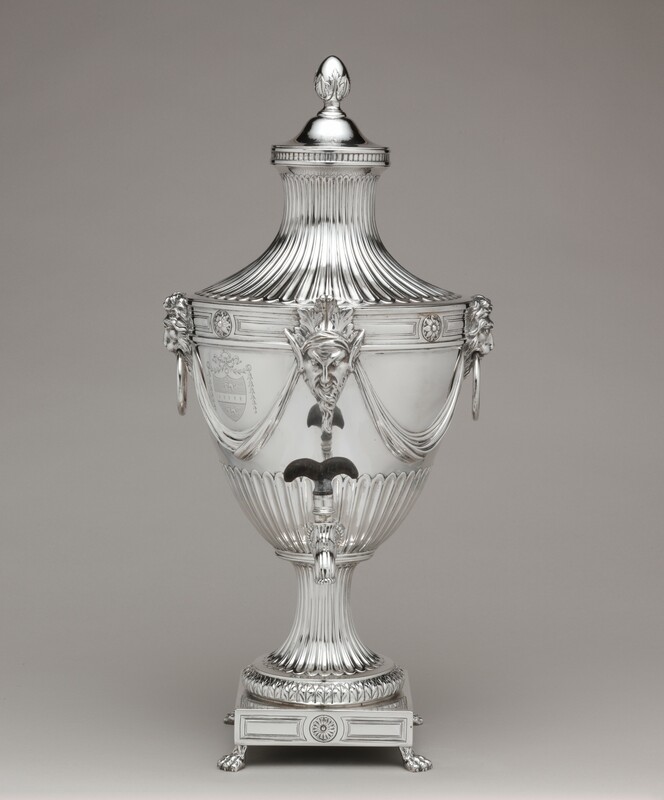 But it could also be a decorative fender, ornamented with urns at the ends. The fireplace grate shown here is English, made ca. 1780 according to the seller) but should you have space cash burning a hole in your pocket, there’s a similar 19th century reproduction of the one in the print for sale on the interwebs, should you care to recreate this image (I know some of you have the clothes). In fact, there are quite few fenders-with-urns, once you start looking, some in bronze and some in steel. And what of this? 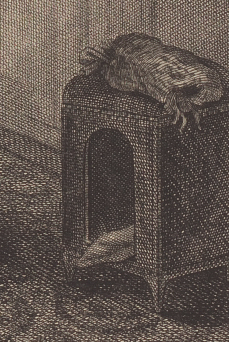 Is that an 18th century dog house or covered dog bed? Yes, it is. 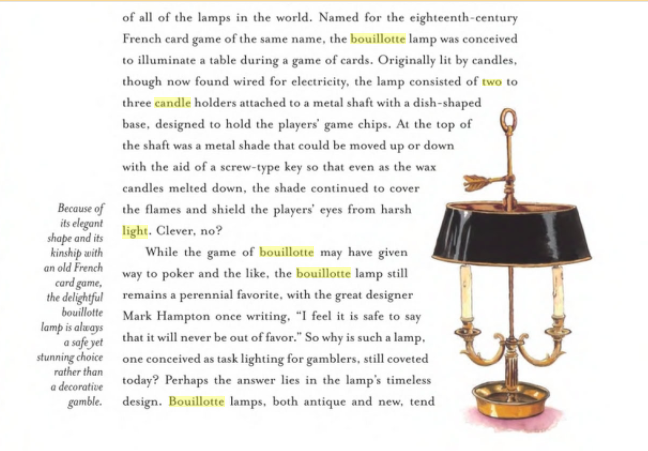 The bouillotte candlestand on the table is another nice household detail, illuminating a book lying open on the table set against the wall. 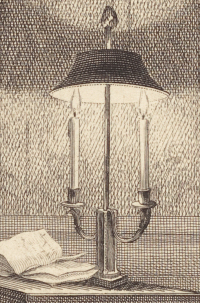 It has taken me some time of looking at period images to accept these candle stands as correct, since my experience with them was grounded in electrified reproductions in suburban Colonial Revival dens and family rooms– a location I will admit I was prejudiced against to begin with, having grown up in a city surrounded by architects devoted to (and buildings by) Mies van der Rohe. 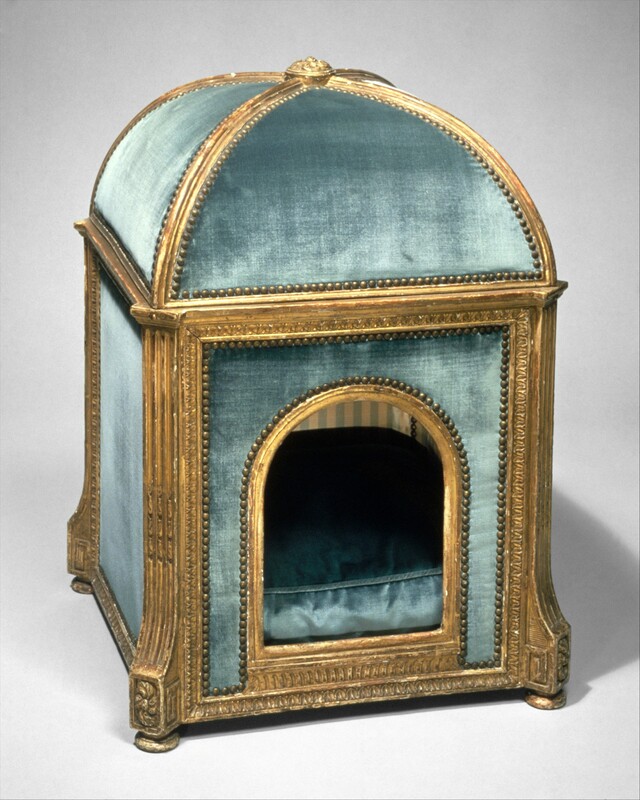 But therein lies the point of looking: what initially seems absurd (Versailles-quality dog beds) or simply anachronistic (candlestands with shades) slides into place when seen and understood, within its proper context. I love a good “close reading!” Thanks for sharing!